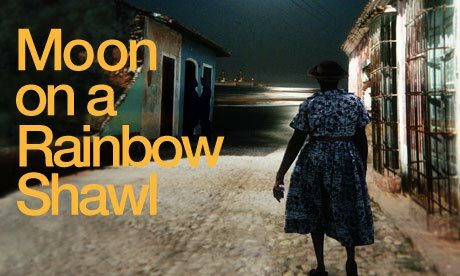 Errol John’s Moon on a Rainbow Shawl is on stage at The National Theatre’s Cottesloe, and aptly it is currently enjoying rave reviews. The play may not be as well-known as other classic literature dramatizing the Caribbean experience but deserves its accolades. There’s so much going on in this Talawa’s production, but this excellent performance never feels rushed, or too busy – a testament to pitch perfect acting by a superb ensemble cast, each delivering high level performances of an intriguing – if somewhat convoluted - story and entertaining script smoothly directed by Michael Buffong. Written in 1957, and set in the late Errol John’s native Trinidad, the drama depicts the vibrant, cosmopolitan post Second World War period in Port-of-Spain that nourished the development of Trinidad &Tobago’s contemporary culture. In this latest production – with revivals already made famous by the likes of African-American luminaries James Earl Jones and Cicely Tyson in an early 1960s production, and Maya Angelou in the Director’s chair in an 1980s outing - John’s timeless writing proves neither dated nor a curious museum piece. Rather it stands out as a perfectly balanced portrayal of Trini cadences, lyricism and humourous vernacular - though not always put across consistently by this truly multi-national cast. The drama is slow to unfold over more than two hours but never sluggish or soporific. More than that, it evokes the pace set by the muggy, claustrophobic barrack-yard community seen in Loudon Sainthill’s programme note illustrations for early productions of the play. Designer Soutra Gilmour is faithful to that heritage with her transformation of The National's Cottesloe. A lively audience on both sides of the auditorium overlook a compact set which crams everything onto its floor level stage: veranda, and yard, a balustraded clapboard porch balcony, a rickety bedsit, old school kitchen equipment, standpipe, iron pails, and tropical flora and fauna. The musical backdrop so central to Trinidadian culture compliments it all with back-in-times calypso, and live guitar playing by Ketch [Trevor Michael Georges] and the Ebony Steel Band [overseen by Nitro/Black Theatre Co-Op’s Artistic Director Felix Cross]. With three Acts split between six scenes, this 1950s style kitchen sink drama introduces us to an ambivalently lively yet stultifying community of several characters and their many anxieties. Some seem trivial, others intimate and personal – love, ambition, pride, frustration, resignation, despondency - with hope and ambition personified by young Esther Adams [convincing played byTahirah Sharif]. All receive the attention of Errol John’s sharply penned focus. Everyone wants to escape something – personal problems, pregnancy, domestic drudgery, and their unfulfilled ambitions or from the Port-of-Spain district of East Dry River, or strangely enough, to Liverpool. Slamming doors and eye-rolling, double entendre and sexual shenanigans give us comedy which just borders on the slapstick and farce, but thankfully never quite enters the dangerous caricature zone – due mostly to nifty directing work from Talawa Artistic Director Michael Buffong. It may be unfair to single out any one actor from such an excellent cast but standout performer and Trini to de Bone Martina Laird’s matriarchal Sophia Adams captures the spirit of the play in a role which she wears like a perfectly fitted carnival costume. Jude Akuwudike’s grizzled, defeated and tragic Charlie Adams also shines. As does Burt Caesar as lecherous landlord Old Mack. His beautiful prey Rosa’s naive vulnerability hides possibly devious womanly wiles in Jade Anouka’s touching portrayal. Most of the humour comes from the gold-toothed Prince [Ray Emmet Brown], and together with the whore-with-a-heart character that is Mavis; with Jenny Jules’ charisma, delicate and graceful beauty and a powerful voice and exquisite acting. The brooding presence of enigmatic and inscrutable Ephraim is illuminated by Danny Sapani, whose quietly powerful, explosive and brooding performance equally mixes passion and authority. It’s all a fitting testament to the enduring quality of the writing of Errol John - who died in London in 1988. His storytelling, narrative and characterisation have left a script that translates just right for today. Skilfully merging Trini colloquial speech - sardonic, rich in allusions and playfulness - with Received Pronunciation English, this drama sensitively sketches the Caribbean island’s people, heritage and recent history. There haven’t been nearly enough revivals of this superb piece of work, but Talawa and The National’s Cottesloe have a deserved hit in their hands, attested to by two well-deserved curtain calls.